Executive Summary: On June 17, 2011, The INSS Center for Strategic Research conducted a seminar on Iraq’s re-emergent energy sector and its impact on national and regional politics. The purpose was to move beyond identity politics by examining resource-based interests and new tensions and opportunities for negotiation between groups in and across Iraq’s borders. Discussions focused on Iraq’s national energy strategy as influenced by regional trends and the impact of petroleum sector development on relations between Baghdad, the Kurdistan Regional Government (KRG) and provincial administrations. To what extent have these developments affected governance in Iraq? What implications do they have for U.S. policy, particularly as the U.S. military withdraws combat troops from the country? Experts on Iraq and the energy sector addressed these issues in two panel discussions. They stressed the importance that oil will play in Iraq but were pessimistic about Iraq’s projections of future oil production. The speakers concluded that “Iraq will not be the next Saudi Arabia anytime soon.” Alongside infrastructure constraints, unresolved political issues between groups will continue to shape prospects for the energy sector. The withdrawal of U.S. combat forces scheduled for the end of this year also is expected to negatively affect Iraqi oil production due to reduced security. The global and regional energy context. Trends in the global energy sector underline the significance and vulnerabilities of Iraq as an oil-producing state. Over the next 25 years global energy demand is expected to rise considerably; by 2030 the world will need about 103 million barrels of oil a day. This increase is anticipated to come mainly from non-OECD countries in East Asia and the Middle East. Growing demand will provide incentives for producers to increase supply, either by using their excess reserves or increasing production. Specifically, it may require that Saudi Arabia produce 5 million additional barrels per day (bpd) and that Iraq increase its production as well. Based on these projected trends, OPEC’s market share can increase from 41 percent today to 52 percent by 2035. Political, administrative and technical bottlenecks.Conflicting incentives and expectations between international oil companies (IOCs) and the Iraqi government are likely to complicate oil production. While IOCs seek immediate production and profit, the central government aims to assure control of oil sector activities, which has resulted in lower profit margins. Iraq’s technical service contracts (TSCs), for instance, have low production minimums and per barrel prices. The Iraqi petroleum sector also remains nationalized and is highly inefficient.Additionally, oil company deployment, security, visas, and Iraqi budget approvals are painstakingly slow and require massive levels of oversight and bureaucracy. Accountability, internal auditing, inventory control, and management of revenues are other major concerns. Conflicts on spending exist between the Iraqi oil and finance ministries, as well as between the central government and local populations. Iraq’s massive limitations on water, power, and export infrastructure pose further difficulties for companies investing in Iraqi oil. Unclear legal environment. Absence of a national hydrocarbons law and inconsistencies in existing laws, a zero-sum and risk-averse business mentality, and inexperience with western contracts create additional obstacles for IOCs. Contractors now want to be paid in kind, which may lead to shrinkage in the oil sector. Moreover, since the Arab Spring, Iraqi citizens are demanding more from Baghdad in terms of equitable and effective provision of goods and services. It will be more difficult for the central government in Baghdad to invest in energy projects that do not yield immediate improvements in the welfare of the citizenry.The central government and KRG will continue to sign contracts with IOCs in the hopes of pressing forward and increasing oil production and revenues. According to one panelist, “Iraq is on its way to becoming a Nigeria on steroids.” Yet there is a growing realization in Baghdad that production levels are unlikely to be met and that service agreements may have to be renegotiated. Such changes will lead to additional costs and frustrations for future investment in the oil sector. Are alternative export options available?Given Iraq’s ambitious oil production plans, the large percentage that petroleum comprises of state income (90 percent) and undeveloped pipeline infrastructure, Baghdad is seeking ways to increase export capacity through its southern and northern routes. Over the past year, the central government has signed contracts with international companies to repair and upgrade its current export infrastructure, renewed pipeline agreements with Turkey, and pursued additional routes.Still, the possibility of Iraq turning to or establishing alternative export routes at this time is unlikely. Developing pipelines through Syria, despite recently signed Memorandum of Understandings (MOUs) between Baghdad and Damascus in September 2010, is unrealistic given Syria’s unstable political conditions. Jordan remains an export point as demand and production increases. An export route through Saudi Arabia would require an unprecedented rapprochement with Riyadh, which does not seem likely in the near future. Additionally, the Saudi pipeline has been changed to a gas line and would need to be restructured for oil if it were to be used to export Iraqi petroleum. An alternative route from the Kurdistan Region northward could be the most pragmatic option as it would provide more reliable access of Iraqi oil to European markets. Yet the Kirkuk-Ceyhan line is still under-utilized and Baghdad has commitments to developing its southern ports. The KRG could not unilaterally pursue such a project since it does not have the legal right to build a transnational pipeline to Turkey without Baghdad’s approval. Despite increased investment in the Kurdistan region and recognition of the KRG in a federal Iraq, the central government and regional states remain concerned about an overly autonomous Kurdish north and cross-border Kurdish nationalist influences. Iran has little interest in a strong Iraqi oil economy that would enhance Iraqi independence and challenge its own petroleum sector. Iran may have a different set of goals, which include gaining a greater influence in the Iraqi energy market and constructing trans-Iraqi pipelines. Most participants agreed, however, that while Iran is uneasy with the idea that Iraq may be on par with Saudi Arabia in regard to OPEC quotas, Iraqis are uncomfortable with Iran’s blatant attempts to gain control of its petroleum, such as seizing an Iraqi oil well briefly last year. Iran could respond by creating trouble for Iraq through a whole host of measures, including targeting IOCs in the south. Nor is Kuwait likely to play a constructive role in Iraq’s oil development. On the contrary, progress on rebuilding relations has been limited since the fall of Saddam Husayn’s regime. Baghdad certainly needs Kuwaiti support to remove sanctions still in force since 1990. It also wants debt forgiveness from Kuwait and greater access to the Gulf. Yet Baghdad rejects the land and maritime borders imposed by the U.N. Basra has already indicated that the demarcation is being changed on the Kuwait border. Iraq also is displeased that Kuwait funded a Syrian irrigation project that diverted water from the Tigris River. Tensions have also reemerged over Kuwait’s building of the Mubarak port, which will rival Iraq’s efforts to enlarge its meager facilities and increase export capacity. How has energy development influenced and been influenced by national and regional politics? Given the centrality of oil to politics in Iraq, energy development has played a key role in shaping the political landscape. Yet there also are limitations to oil’s role in resolving the country’s problems. Underlying the future of energy development are issues of national reconciliation and state structure, or where power resides in Iraq. Specifically, while the Kurdish parties heavily favor a confederal structure where they have larger revenue distribution and control of local resources, other Arab parties are mixed regarding the issue of state structure. Prime Minister Nuri al-Maliki’s Dawa party and the Sadrists favor a centralized state and Baghdad’s direct control over the oil sector. Some Arab Sunni groups, however now support confederalism as a means of increasing their influence in a federal Iraqi state. Most Iraqis, regardless of ethnic or religious identity, want some benefit from oil or gas production in their province or region. If the KRG gets greater local control over its oil sector, southern Iraqi provinces are likely to make similar claims. For instance, Anbar is pressing to develop the liquefied petroleum gas (LPG) fields in its province and gain greater control over the local security situation. Energy intensifies existing debates over Kurdish autonomy. For the KRG, control of oil would facilitate demands for economic independence and allow it to ignore Baghdad. The KRG not only wants to control its own oil, but also seeks to delineate borders and resolve issues of disputed territories, particularly Kirkuk. The KRG thinks that a confederal structure would check the power of the central government and give it sufficient leverage to negotiate political issues. The KRG also views confederalism as the best guarantee for its own security, at least in checking Baghdad’s potential control over regional affairs. Energy creates new resource-based tensions. The unclear and competing visions of the nature of the Iraqi state – whether power should be centralized or decentralized – and the drive to increase oil revenues have influenced Baghdad’s relations with provincial administrations and the KRG. One of the tensions is over management and control of the oil sector and its revenues, enhanced by deliberately written ambiguities of the 2005 Constitution. Article 112 discusses the intent of the central government to work with regional and provincial governments. Yet it also has been used by local administrations to assert their authority over oil fields in their provinces. The Wasit provincial council, for example, attempted to shut down an oil field operation in its territory in September 2010, claiming that article 112 gave it the right to do so.Iraqi populations also are claiming a greater share of oil revenues, which has led to new resentments over perceived inequalities among provinces. Although Article 140 of the Iraqi constitution created mechanisms to give oil-producing provinces one dollar for every barrel produced, this revenue has not been distributed equally across Iraq. Basra has benefited because it has the most petroleum production, as well the fact that it is closely intertwined with Baghdad and the regime. Oil-poor provinces such as Anbar, however, have been ignored in the new Iraqi state and in its distribution of petroleum rents.In some cases in southern and central Iraq, these tensions have escalated to attacks on local leaders. As a result, governorate-level security forces are assuming greater control of well site security, which is intensifying the conflict. Al-Maliki has responded by assigning the Iraqi army to guard the oil pipelines, although this effort is unlikely to be accepted by provincial leaders who rely on their own local security forces and are pressing for regional-based security. Additionally, many of the IOCs do not trust Iraqi security forces and may take increasing responsibility for their own security by building airstrips to internalize personnel movements and using private security forces. While most provinces want some benefit of energy sector revenues, the KRG has been the most aggressive in demanding complete control over oil and gas production in the Kurdistan Region. Arbil has taken advantage of Baghdad’s intransience and resisted integration into an overall national structure. Since 2002 the KRG has signed 37 production sharing contracts (PSCs) and has earned over one billion dollars in signing bonuses alone. Additionally, the KRG has placed oil companies beyond the Kurdish-Arab border in the disputed territory of Kirkuk. This strategy has created new “facts on the ground” to entrench its political and economic interests. Energy encourages deal-making. Weakness in the federalist structure alongside energy sector demands have encouraged deal-making between the various factions in the Iraq government. Given the budgetary problems faced by Baghdad and Arbil (Baghdad has a deficit and the KRG has not paid the IOCs), a compromise over oil payments may be possible in the near future. For instance, the Kurds and the opposition Iraqiyya Party of Ayad Allawi appear to be combining efforts on oil and gas issues by claiming the bid rounds are unconstitutional. The Kurdistan Alliance also gave the oil and gas committee chairmanship to Adnan Janabi, an Iraqiya member, who has introduced a law separating oil operating companies from the Ministry of Oil. Other pressures for a compromise could be linked to Turkish policy shifts, the KRG’s need to pay IOCs in its region, and increasing demands from some provinces in southern and central Iraq about greater decentralization.Still, Baghdad-KRG negotiations are slow and uncertain. The central government has partially paid the costs of only two oil companies in the Kurdistan Region thus far, but not their profits. The payment was not part of an officially approved or audited scheme, but rather, a secret agreement and political bargain between al-Maliki and KRG Prime Minister Barham Salih. Compromise can be further deterred by revenue growth, frustration from Baghdad with Kurdish maximalist policy, territorial disputes, and U.S. policy appearing to favor the KRG. What are the outstanding issues in negotiating a national hydrocarbons law? The debate over control of natural resources and revenue-sharing has had important implications for Baghdad-KRG relations. While the KRG wants petroleum to be managed and negotiated locally with limited revenues transferred to the central government, Baghdad seeks greater control of the energy sector and distribution of its finances. Similarly, the KRG has emphasized that it wants to limit the central government’s role in revenue-sharing. These differences have played out in the failure to ratify a national hydrocarbons law and revenue-sharing law. Legitimacy and Nature of Production Sharing. One of the key issues between the KRG and Baghdad is the legitimacy of the PSCs signed by the KRG Ministry of Natural Resources. Recognition of the Kurdish contracts will partially depend upon which faction wins out in the central government. The “common sense” faction, led by Adnan Janabi, could allow for negotiation and recognition of the PSCs. Janabi believes that making a deal with the Kurds will help put him in a position of power and assist Ayad Allawi in becoming Prime Minister. Deputy Prime Minister for Energy Affairs, Hussein al-Shahristani and al-Maliki represent the “non-common sense” faction that is trying to preserve centralization. They pose the strongest challenge to the KRG and recognition of the PSCs in their current form.Even if the Janabi faction prevails, Kurdish contracts and payment mechanisms would be subject to a large host of processes, accounting procedures, and audits by different Iraqi ministries and agencies. Baghdad also could recognize the PSCs but structure them like the TSCs used in southern and central Iraq. Negotiation also depends upon the KRG, which has been unwilling to open its oil and financial records to Baghdad or use its own revenues to pay IOC profits. Whether or not a national hydrocarbons law is essential to Iraqi petroleum production is questionable. While it would allow large companies to expand beyond their current boundaries by clarifying complex responsibility and timing issues, an oil law ultimately is not necessary to resolve the larger Baghdad-KRG dispute about the structure and nature of power in the Iraqi state. What effect will U.S. military withdrawal in Iraq have on the country’s oil production? The U.S. withdrawal is expected to have a negative impact on Iraqi oil sector development by contributing to delays in production and exportation and removing an important source of logistics, intelligence, and security for the Iraqi government and IOCs. The absence of the U.S. military also will increase the transaction costs of doing business in Iraq. Increased security risks could diminish interest in the next bidding round since fields are smaller and in riskier areas. It may also give greater access to Chinese and Korean national oil companies, which have invested in Iraq’s oil sector and are generally interested in new wells, alongside increased economic and technical cooperation. The Chinese National Petroleum Company (CNPC) currently is developing the Halfaya oil field and has partnered with British Petroleum (BP) to develop the super-giant Rumaila oil field. The Chinese National Offshore Corporation (CNOOC) is leading the development of the 2.5 billion barrel Missan oil field in southern Iraq. Building-up staff capabilities.According to one energy expert and former U.S. diplomat, the U.S. could build up staff capability in the Iraq oil ministry and national oil company. These efforts could include developing collaboration between actors, streamlining procurement in large bureaucracies and energy systems, and encouraging Iraqis, who tend to feel they were once good technocrats and do not need help to become successful, to update their skills and knowledge of the energy sector. Increasing diplomatic focus on keeping the country stable will also help move it forward.The most successful model for Iraq could be one in which the World Bank and the International Monetary Fund provide assistance to the ministries. This third party model would provide the unique expertise that is needed without direct American involvement. Revisit U.S.-KRG relations. A U.S.-KRG alliance was vital to realize immediate political objectives after the 2003 war and is important to assuring regional stability. Yet now that these objectives have been realized, at least in part, some thought the United States may need to revisit its approach and policy toward the KRG. Washington should send a message to the KRG that it will continue to protect the Kurds, although not unconditionally in light of growing KRG authoritarianism and disinterest in opening financial records to Baghdad. The United States should also stop acting as a safety net for the Kurds, which is breeding resentment among Arab Iraqis and could impede future negotiations between Baghdad and Arbil. Known unknowns. There are several unknowns in Iraq’s energy future that the U.S. needs to consider, including the Sunni Arab response to the U.S. departure and stability of the country. Shi’a areas have had fourth-round oil development contracts; however, all gas development remains in Sunni Arab and mixed areas. It is uncertain how this aspect of energy development will unfold. The Sadr movement’s response to the withdrawal or ongoing presence of U.S. troops could also jeopardize oil production and force new political alliances that are less welcoming to IOCs and the privatization of the oil sector. The nature of these alliances is uncertain, and one that can reformulate the energy sector potential. A final uncertainty is the future of democracy in Iraq as its leaders pursue rapid oil development. Will the federal system in its current form be sustained and if not, what type of state and political system will emerge? How would political changes affect economic development and wealth distribution? Who will benefit? Dr. Denise Natali is the Minerva Chair at the Center for Strategic Research at National Defense University’s Institute for National Strategic Studies. She may be contacted at (202) 685-2249 or denise.natali@ndu.edu. The views expressed are her own and do not reflect the official policy or position of the National Defense University, the Department of Defense, or the U.S. government. What happens when Yemen runs out of oil? Yemen is a nation on the brink. Although ongoing for the past two years, more attention has been drawn to the civil war in Yemen due to the political turmoil being experienced across the MENA region since January 2011. In fact, the country is split along three completely separate fault lines, leading to further chaos than a simple two-faction conflict. First, the resource poor north is at war with the (relatively) resource rich south. Second, tribes loyal to President Saleh are at war with non-aligned tribes. Third, the Islamists are at war with the secularists. These various groups are by no means homogenous themselves and have varying motives ranging from the establishment of a new and unified government to secession and the breakup of the Yemeni state. The recent events are symptoms of a larger issue and serve to highlight the real threat to Yemen’s future: The growing scarcity of essential resources. Oil production and export accounts for roughly 70-75 percent of government revenue and by some estimates, Yemen could run completely dry by 2017. Such speculation is not based in paranoia. As of January 2010 Yemen’s proved oil reserves were placed at 3.16 billion bbl (oil barrels). Despite some upsets to production in March 2011 and thanks to an emergency oil transfusion from Saudi Arabia, oil production has leveled off to around 150,000 bbl/day (barely enough to cover consumption based on 2009 rates). Even at such a low rate of production, it is clear that not much time is left. An unstable state to begin with, when the petrodollars are finally cut off the results could be disastrous. The central government has already received a taste of what could be in store when the oil finally stops flowing. Following the March 2011 bombing of the critical 140 mile pipeline that ran from the Maarib oil fields to the primary refinery in Aden, oil production effectively fell to zero throughout the spring. The suspected losses from this brief period of stopped output hover at the billion dollar mark. To an economy whose GDP is only $60 billion to begin with, and an annual deficit of approximately $2.5 billion, such a loss is catastrophic. The money that flowed from the central government to its tribal guarantors sustaining Yemen’s system of patronage effectively ceased. Since Saleh came into power thirty years ago the government has maintained a carefully designed network of money transfers and political appointments. As long as the central government has kept the roughly 4-5,000 tribal leaders paid-off they have been able to maintain their loyalty and control over regions that Saleh’s government would otherwise have difficulty maintaining. The money, like the oil, has slowed to a trickle. Since the January protests calling for President Saleh’s ouster, a spotlight has been cast on the dangers brewing in Yemen. Intelligence officials have long been aware of the threat of extremism for which Yemen seems to be a breeding ground. It has become increasingly clear that AQAP (Al-Qaeda on the Arabian Peninsula) and other sympathetic groups have a strong presence in the country. Some speculations are that there are as many as 500 Al-Qaeda and sympathetic militants in Yemen already. 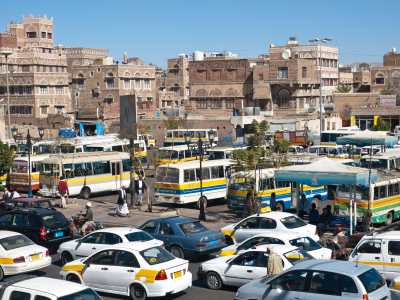 What will happen to the Yemeni state as it exists today if the government totally collapses? The United States has long had a close relationship with Saleh’s government. No small part of this is the strategic waterway that Yemen occupies. The Gulf of Aden is one of the most crucial waterways to international maritime economy and certainly for oil transport. It is no secret that the United States has taken a vested interest in protecting it since the British left in 1967. Piracy is a major threat in the Gulf of Aden. While most attacks originate from Somalia, widely accepted to be a failed state, a stable Yemen is essential in staving off this threat. If Yemen were to collapse and Western navies were to lose the strategic foothold of Aden in the region, it is easy to foresee the increased danger to maritime activity. Finally, Saudi Arabia has a vested interest in what happens in Yemen and to say the Royal Family is concerned is an understatement. Proof of this is the selling, turned “charitable contribution”, of 3 million bbl conceivably intended to prop up the flat-lining Yemeni government while it retakes and repairs the broken pipeline connecting Aden with Yemeni oil fields. Of course this amounts to sticking a finger in the dike, as it is yet to be seen what lengths Al Sa`ud will be willing to go to keep Yemen limping along. The question remains: What will happen to Yemen when it finally runs out of oil? It is around the corner, yet no infrastructure or social organization exists to absorb the shock that will take place to the economy. Even if the money and/or resources existed, it is difficult to imagine that the appropriate safeguards could be put in place in time. There is no infrastructure or institutional mechanism to absorb or resolve any crisis—political or economic. The Saudis have already begun to prepare for their eventual future of running dry (one that is considerably further off). They have instituted programs promoting both alternativeenergy and public education that will (theoretically) carry the country into a post-petrol economy. Of course this has been funded by massive amounts of oil money that Yemen could not have matched in its most productive years. Is Yemen destined to become the Arabian Peninsula’s Somalia? Worse still for Yemen is that running out of oil is not the biggest catastrophe it will face in the near future. The desert nation is already beginning to exhaust its natural aquifers and has neither the money nor geography to take on desalination projects. If Yemen cannot survive an oil crisis, what government will be left to deal with a water crisis? Ted Pikulsky is the Assistant to the Director of Communications at the Institute for National Strategic Studies, at the National Defense University. He is currently conducting research on media, communications and political processes. He holds a MA in History from Washington College and a BA in International Relations and Economics from Boston University. Gulf Disaster: More Than Just An Environmental Catastrophe? While certainly not trying to downplay the magnitude of the spill, its catastrophic environmental effects, or the blundering of BP in resolving it, Mr. McKay’s words should not go unheeded. President Obama and Congress, reacting to the cries of angry Americans, have cracked down on the oil industry and placed a moratorium on all new drilling leases. While these actions are understandable, keeping in mind the above quote, it raises the important question – is the U.S. at risk of allowing the Gulf of Mexico oil spill to unduly affect the future of offshore drilling and domestic energy production? The rhetoric out of government officials has placed a heavy emphasis on energy independence and security – of which domestic production is a key component. While prudent reforms are clearly in order, at stake is not simply the ecosystem of the Gulf coast, but also the livelihoods of thousands of Americans and potentially the security of the nation.